Whether you’re throwing yourself down a World Cup run or honing your skills on your local course, you need complete focus for Downhill and Enduro racing or Free Riding. That means you need optimum grip, balance, comfort and stability from your pedaling platform which you can find in SHIMANO’s new AM9, AM7, GR9 or GR7 shoes in combination with the M820 SAINT-level SPD pedal, or the SAINT-level M828, DEORE XT-level M8040 or GR500 non-series flat pedals. Before the function though comes the fit. For more than 25 years SHIMANO’s has been examining feet to learn exactly what mountain bikers need from lasts, sizes, supports, grips and styles, combined with SPD or flat pedals, to create footwear and pedal systems designed excel in different riding conditions. What’s more, SHIMANO perfects these partnerships with the world’s best riders so we can be sure you can get the performance you need to power your pedals. The flagship All-Mountain AM901 shoe is designed for Downhill and Enduro riding and, with a revised Upper, offers reduced water ingress, quicker drying times and greater protection over previous models. The added molded toe cover offers protection and the quick lacing cord further reduces water ingress and improves adjustability in all weather conditions. The ultra-grippy, high traction rubber sole makes walking easier and improves contact with the pedals. A handy pedal channel on the sole behind the cleat creates a stable pedal connection when clipped out. At 400g (size 42) the shoes are best paired with the 546g SAINT M820 SPD pedals. Below the AM9 is the AM701 (408g) seen below, which is now also an SPD shoe. Unlike the AM9, the AM7 removes the lace shield, offers a harder sole and uses an ankle gaiter to offer protection and keep out debris. The AM701 has a stiffer midsole (stiffness rating: 6) than the AM9 (rating: 5) for trail riding. It also comes in a super loud lime green option to stand out on the trail. Completely new for 2018 are two dedicated Gravity shoes. The top-level GR900 shoe shares many of the outstanding protection attributes of the AM901, such as the asymmetric raised ankle collar, armoured lace shield and molded toe cap, but the difference comes with the GR9’s simplified sole construction. Not only do you get superb grip and improved walkability from the Michelin rubber outsole but the GR900 is 35g lighter than the AM901, weighing in at 365g (size 42). The GR9 is best paired with the SAINT M828 493g flat pedals. Much like the All-Mountain line-up, the gray/green or blue GR700 (366g) ditches the armoured lace shield for increased heat ventilation and a more multi-purpose looking shoe. The GR7 is also available in a dedicated size for female feet. YOUR CHOICE: PEDALING DYNAMICS OR PEDALING PLATFORMS? 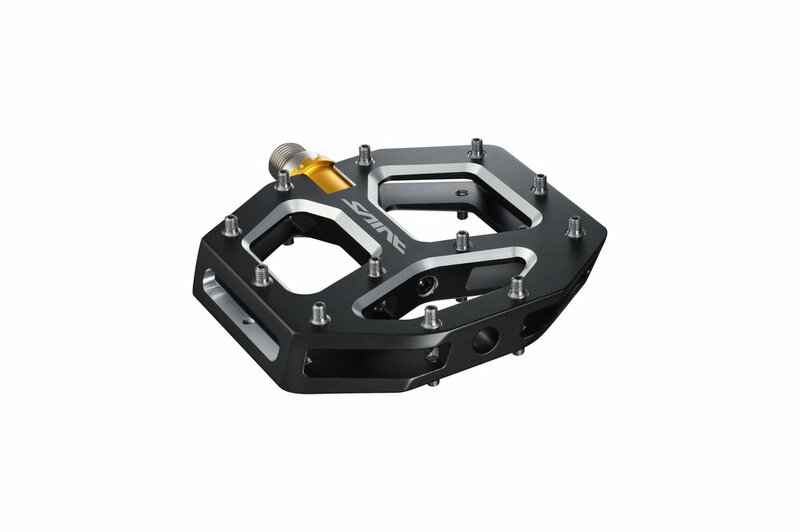 SHIMANO’s revised Gravity pedals feature one SAINT-level SPD option, three flat pedal options at SAINT and DEORE XT-levels, and a non-series option, all designed to fit perfectly and offer optimum pedaling connection with Shimano´s Gravity and All-Mountain shoes. The SAINT-level PD-M820 (pictured below) is one half of Shimano’s most advanced Downhill and Enduro-specific pedals offering ultimate bike control, contact, grip and durability with SPD efficiency and stability. The M820’s wide alloy body is system engineered to match perfectly with the AM901 shoe providing a very solid pedal/shoe interface. The double-sided durable alloy pedal body protects the SPD mechanism from impacts whilst the low profile design lowers the stack height and the weight (546g). Four adjustable pins per side offer grip when you’re not clipped in. Its compatriot, the SAINT-level strong and durable PD-M828 (pictured below), is an eight-sided concave platform pedal offering excellent grip and support. Twelve stainless steel pins per side (optional 3mm or 5mm) deliver the aggressive downhill or free-rider the ideal balance of connection to the bike and pedaling stability, with the best balance of weight and durability across riding conditions. The DEORE XT-level PD-M8040 (pictured below)comes in small-to-medium (shoe size recommendation 36-44) or medium-to-large options (shoe size recommendation 43-48) for optimized support and rider-tuned performance. With 10 pins either side and a slight concave design for comfort and efficiency, these Trail and Enduro pedals offer the legendary off-road performance associated with Deore XT. Sold with optional 3mm pins or 5mm pins. Weights: 460g (S/M) or 503g (M/L). Thomas Vanderham, free ride athlete and Shimano test rider: “I’ve been testing the PD-M828 flat pedal with the GR900 flat shoe and I’m really happy with the developments. These pedals are bombproof. The support under foot is excellent due to the large platform and my feet feel really well connected to the pedals. They've handled everything I can throw at them and really live up to the SAINT name. “The GR900 shoe is a perfect match. The new sticky rubber compound from Michelin provides a ton of grip and we worked a lot on the sole stiffness to find the right balance of support and pedal feel. Additionally Shimano incorporated some nice features like a rubber toe cap for added protection and quick drying construction so that you don't wake up to wet shoes!" Finally, the PD-GR500 builds on the strong reputation of its predecessor (PD-MX80) as a Shimano-branded durable flat pedal for entry-level Trail and All-Mountain riding. 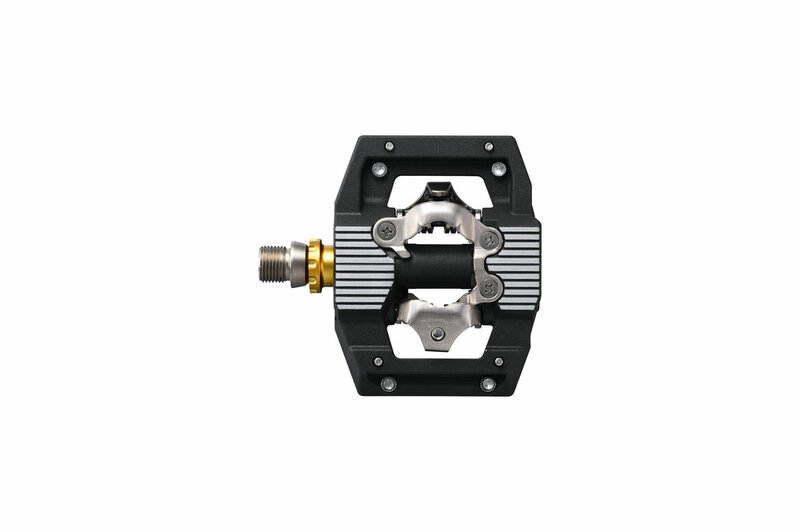 The PD-500 features height-adjustable pins and low-maintenance sealed cartridge bearing chromoly axles, available in black or silver options at a weight of 533g.